I’m Lucas Allen, a salt water fly fishing guide based in Tauranga, the sunny Bay of Plenty, New Zealand. I offer guided salt fly fishing trips based mainly around the Tauranga harbour flats. Take a look around to find out more about the exciting aspects of salt water fly fishing in New Zealand. Check out the video links below for a taste of New Zealand salt fly action. Spring through to Autumn (October-May) is the prime time to target the many exciting salt fly species available. Kingfish, snapper, kahawai, trevally and tuna all present great salt water fly fishing targets. The main draw card being the shallow water flats style fishing chasing kingfish. It’s visual, challenging and really tests the anglers mettle. Affectionately known as Ray riders these kingfish cruise the backs of Stingrays looking for easy pickings as they cruise the vast salt flats. This presents the ultimate sight fishing challenge and is sure to get any fly casting enthusiasts heart racing. Top end fly fishing gear and equipment specifically for the harsh salt water environment is provided. Scott fly rods, Hatch and Lamson fly reels equipped with Airflo fly lines are used daily and stand up to the punishment salt water species hand out regularly. 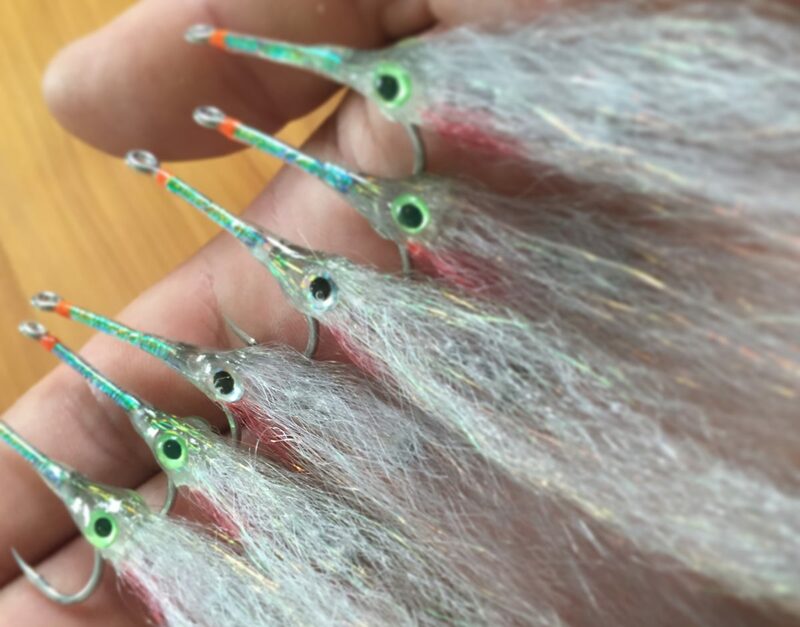 Hand tied salt flies picked for their local specifics are also provided and can be purchased for future use. For more information on equipment and rigging techniques look through the blog page for posts to help you out. King Tide is a 14ft aluminium Fish City “tinny” responsible for many New Zealanders recreational fishing. It is fully surveyed to stringent commercial requirements and provides a safe, stable and uncluttered fly casting platform. Fitted with a bow mounted Minnkota electric motor we can stalk fish in shallow water with no issues. For all bookings and further information you can contact me here. I look forward to getting you on the water and into the action.